MileSplit #4 Bishop Hendricken enters the New England Championship as the favorites. Hendricken had to battle in state rival LaSalle Academy (MileSplit #20) to win the RI All-State meet on Sunday where the Hawks won 30-35. 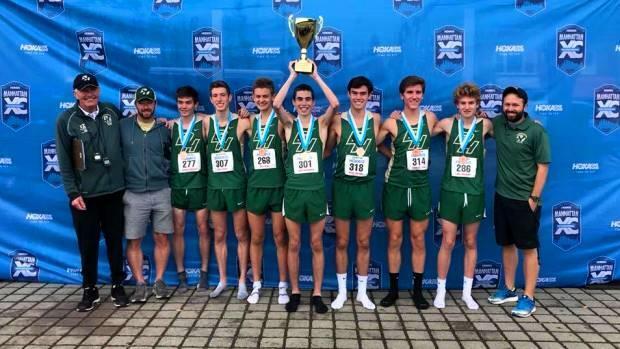 Hendricken placed their scoring five in the top nine finishers, while LaSalle had all five in the top thirteen. The Hawks have won the most New England team titles, they have twelve to their credit and will look to add lucky thirteen on Saturday at DerryField Park in Manchester, NH. A year ago they placed third, one spot in front of LaSalle, who has won the second New England titles with ten. Defending champion Xavier from Connecticut has been coming on strong down the stretch. They won the Connecticut State Open team title last Friday with a score of 75, 46 points on the runner-up William Hall High School. They lack a strong 5th runner like the schools from Rhode Island so a repeat seems unlikely. New Hampshire Meet of Champions winner Concord figures to make a run at the top three, they were fifth last fall, and hope to move up in 2018. With the meet in New Hampshire they certainly with be familiar with the layout at Derryfield Park. It's hard to imagine the winner won't come from the four team mentioned above. Also competing will be D1 state champion Essex the top school from Vermont, while Scarborough the Class A champion is the top Maine school. To determine the scores below we took an average of each team's 5k efforts during this fall.